This very elegant edifice stands on the premises of the “Slavich” joint stock company. Designed by V. Izhikov, it was built on the initiative of veterans of this enterprise. 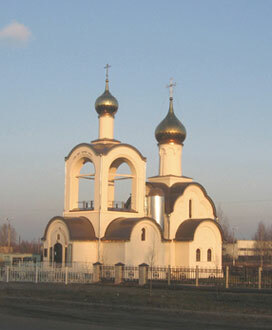 Buried in its foundation is a capsule with the text: “Laying the temple chapel after Saint George was blessed by the Archbishop Mikhey of the towns of Yaroslavl and Rostov and erected with donations from the citizens of Pereslavl and from enterprises of Pereslavl, Yaroslavl, Moscow and Ekaterinburg. The 18th of May, 2000 AD. 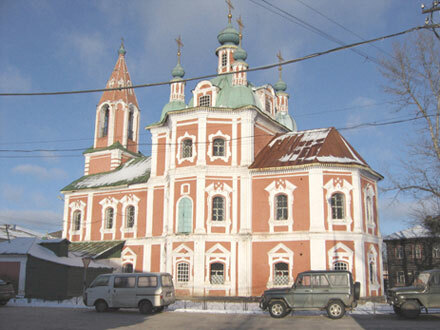 Pereslavl-Zalessky”. The chapel decor includes elements of the highest award in Russia — the St. George medal. It crowns the cross, the window bars, and the enclosure wall. The chapel commemorates the 12 333 citizens of Pereslavl killed in the Second World War, in Afganistan and in the Chechnya wars.